[Blind Gossip] You have seen this famous celebrity many, many times. However, they have never looked quite like this! Our beautiful celebrity usually presents themselves quite differently. While they look different on the outside, if they spoke up, you would certainly recognize their voice. Unless you’ve been stuck in a rut or are hitting the bottle, you’ll definitely remember having seen them on TV. That’s not their only talent, though. We know it’s tough, but try to guess these photo blind items without cheating! [Optional] Do you like this look on them? 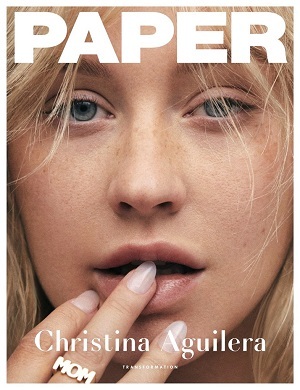 Singer Christina Aguilera has been wearing heavy makeup for so long that it was difficult to recognize her in the minimal makeup look she did for the cover of Paper magazine. Many of you opined that the minimal makeup look makes her look younger and prettier, so it will be interesting to see if she utilizes it more often. She has certainly had some interesting looks over the years, but while a judge on The Voice, she seemed to consistently sport that ultra-blonde/dark eye/red lip look. Speaking of The Voice, Aguilera just announced that she will not be returning to the show! Ever! Aguilera, who was a regular on The Voice from 2010-2016, says that she felt “suffocated and restricted” while on the show. I didn’t get into this business to be a television show host and to be given all these [rules]. Especially as a female: You can’t wear this, can’t say that. I would find myself on that show desperately trying to express myself through clothing or makeup or hair. It was my only kind of outlet. It became something that I didn’t feel was what I had signed up for in Season 1. You realize it’s not about music. It’s about making good TV moments and massaging a story. Yep. We’ve been telling you that for years. There seems to be a little public relations war going on right now. Christina is blasting the show as not being about the music. The show is blasting Christina as having been replaced by Miley Cyrus because Christina was too difficult to work with. Did you catch the clues in the original blind item? Beautiful, bottle and tough = Aguilera’s songs Beautiful, Genie In A Bottle, and Tough Lover, voice = her role as a judge on The Voice, rut = her fiance, Matthew Rutler. Congratulations to CherryBomb27 for being first with the correct response! Special kudos to those of you who worked those clues! Clues: “Their Voice” she was/is a judge on the voice, also her song The Voice Within. “Hitting the bottle”- Genie in a Bottle. Christina Aguilera. She looks really, really good! She looks gorgeous! Love this look on her. [Optional] Do you like this look on them? Yes, it is very pretty vs the usual overdone look. And without all the paint and sparkles she looks 15 years younger. The magazine pictures are awesome. She looks like a teenager without all the make-up. [Optional] Sure, she looks good. Christina Aguilera? was on talent-show The Voice, and the pic looks like her, when she was 16y.o. She looks lovely, the hand in her mouth is old though. Really. Old. Chloe Sevigny. Not sure about the clues, apart from multi talented bc she’s maybe also a fashion designer. This looks like a young Christina Aguilera – could be wrong. I never would have guessed that to be Christina Aguilera. She definitely looks better and younger without all that makeup. Christina Aguillera – she looks so young and sweet without makeup. She looks like a clean version of Christina Aguilera. Kinda looks like Kesha to me? Christina!!! I love this look I think she looks so natural and stunning!!! My first thought was that it looked like Kesha but the clues pointed me to a Christina Agulia.